NEWLY REMASTERED IN HIGH DEFINITION - STUNNING! Lowbudget Records are proud to present our first Blu Ray! 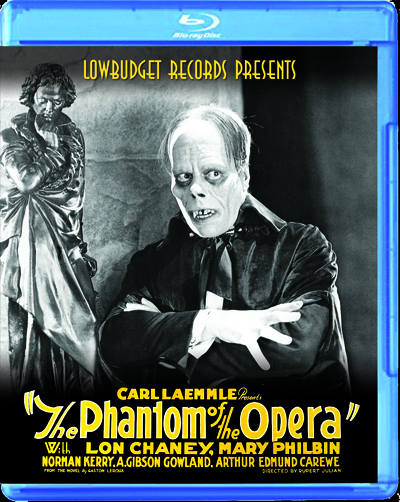 Lon Chaney Sr. left an image for the ages as the insane maestro whose obsessive love for a beautiful soprano brings tragedy and horror to the Paris Opera House! This version contains RESTORED FOOTAGE from a 1925 16mm print which includes many scenes not available in all other home video prints as well as deleted scenes reconstructed from photographs. Coupled with an AMAZING soundtrack by Doctor X, this is one of the most entertaining versions of this timeless classic available on home video.